We accept payment via Visa, MasterCard, American Express and also offer credit terms for approved accounts. Contact us for a credit application. 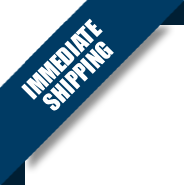 Your order will ship from Illinois, in the most economical way available based upon what you have purchased and your location. Applicable taxes will be charged on your full purchase unless we have a tax certificate on file. If you have a tax form on file with us, you will not be charged tax on any of your purchases unless at checkout you change the tax status of the item to yes. We accept Visa, MasterCard, American Express and Open Account (subject to credit approval).